Flying to and from the Aerodrome is quite straight forward. Although Redhill Aerodrome is located within the Gatwick Control Zone and beneath the Gatwick Control Area there is no requirement to contact Gatwick ATC. The Aerodrome operates H24 although it is only staffed during the following periods: summer 0800-1800 hours UTC and winter 0900-1700 hours UTC. General Aviation training flights are restricted to the periods when the Aerodrome is staffed (ATC and ARFFS being available). Pilots may apply to the Aerodrome Manager for Out of Hours Permits. Flights by AOC holders outside ATC hours will be subject to the Out of Hours surcharge. 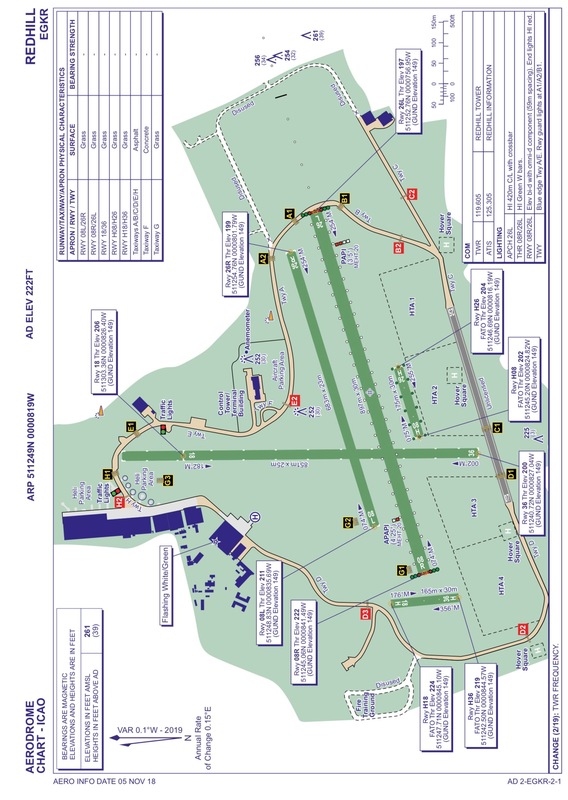 The UK AIP entry for Redhill contains operational information and details of the Redhill LFA and Redhill Aerodrome ICAO Chart. A diagram showing areas to be used for pre-take off checks together with helicopter training areas can be found here. All aircraft using Redhill must have a serviceable transponder with altitude reporting. Those aircraft that do not may apply to the Aerodrome Manager/SATCO for an exemption. Visiting aircraft will be deemed to have an exemption by virtue of obtaining PPR. The use of Runway 18/36 is restricted to transponder equipped aircraft. To assist pilots in remaining outside Gatwick (Class D) airspace specific arrival and departure routings based on four Viisual Reference Points (VRPs); M23/M25 Motorway Junction, Godstone, Godstone Rail Station and Buckland Lake are operated. Compliance with these procedures is mandatory. Within that part of the Redhill ATZ within the Gatwick CTR (Runway 08L/26R to the South) pilots must operate according to Visual Fight Rules (VFR) relating to Class D airspace; minimum ground visibility of at least 5000m and/or cloud ceiling (BKN/OVC) at least 1500ft. Diagram of Fixedwing procedures for Runway 08/26. A detailed diagram showing the Runway 08 departure is available here. A detailed diagram of the Runway 26 departure is available here. Diagram of Helicopter procedures for H08/H26. Diagram of Fixedwing procedures for Runway 18/36. Diagram of Helicopter procedures for H18/H36. The use of Runway 18/36 is restricted to transponder equipped aircraft. 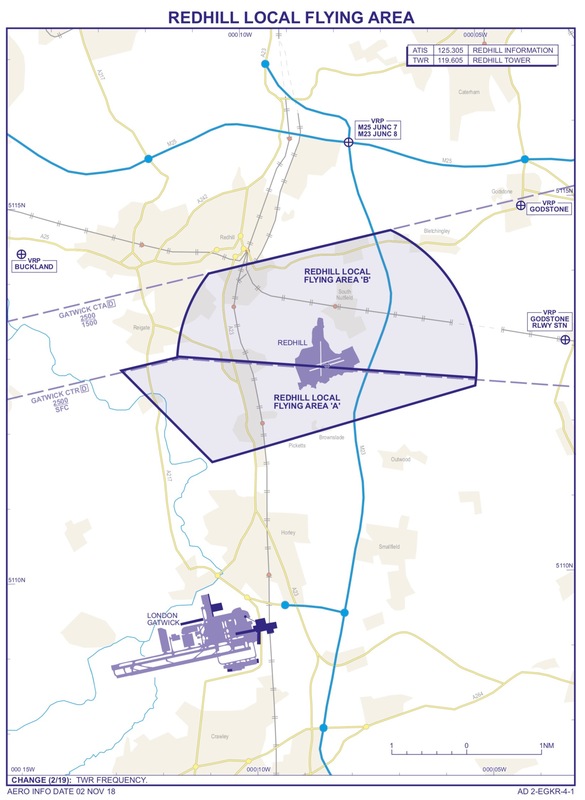 A summary of local procedures for pilots using Redhill is available to download here Guide to Fixedwing Operations at Redhill (v8) and Guide to Helicopter Operations at Redhill. Fixed-wing aircraft and helicopters operate two completely separate circuit patterns. Runway 08/26 - fixed-wing circuits are flown to the north of the aerodrome and the helicopter circuit is flown to the south. Runway 18/36 - fixed-wing circuit is flown to the east of the aerodrome and the helicopter circuit is flown to the west. All aircraft flying circuits must remain within the Redhill ATZ. The circuit height for fixed wing and helicopters is 1,200ft QNH day and night. All helicopter procedures at Redhill are based on ICAO Annex 14 Volume 2 - Heliports. All helicopters air-taxying to/from the northern hangars will use Runway 18/36 as an air taxy route. Helicopters using the grass stands north side of the Terminal Building are to ensure that they remain north of the entrance road to the car park when routing to/from Runway 18/36. Two heli-strips (170m x 20m) are marked on the Aerodrome, one parallel and to the south of Runway 08R/26L and another parallel and to the west of Runway 18/36. These helistrips will normally be used by single engine helicopters up to a maximum overall length of 13m. Single engine helicopters with an overall length greater than 13m and multi engine helicopters will operate from areas notified by ATC. When the weather conditions preclude VFR operations within Class D airspace helicopters, may subject to a maximum tailwind component of 10kts, arrive and depart via the Runway 18 displaced threshold markings operating to Class G VFR minima (visibility 1500m, clear of cloud with the surface in sight).